Outline offers different options for adding pictures to your page. First, please make sure your camera works well. Then click + on the toolbar at the top of Outline window and choose Take Photo. It will be added to the page automatically. Want to insert an image you already have on your Mac? Click Add Picture and browse for it in your files. You can also drag&drop it from Finder. - OR you add an image right onto a page and are free to move, re-size and annotate it. For annotation tap an image and select Set as Background from the context menu. Press ⇧ + CTRL + ⌘ + 4 to take a screenshot and ⌘ + V to add it to Outline page. You can add capture to your page as well. Right-click on the page where you would like to place it and choose Capture Selection from Screen. If you need to locate an image somewhere else on a page, just drag and drop it where you want to. 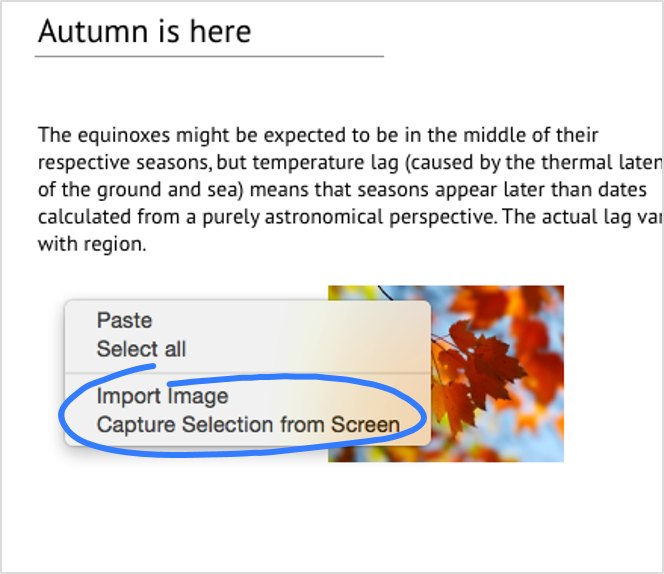 To move the picture inserted to your text outline use right-click to Cut and Paste it to another place on a page or keyboard shortcuts ⌘+X and ⌘+V.